We started this review excited by the prospect of these cymbals, yet slightly sceptical about the concept. What could have been the solution to a barely-existent problem has actually produced three characterful cymbals. The Uptown Ride is a standout. The last few years has seen the drum industry embark on a mission to make our lives as gigging players more manageable. From downsized kits to lightweight hardware, the brief being to transport a kit more easily, fit it into smaller and quieter gigging spaces and reducing the overall pain of playing live. While hardware and shells are undoubtedly the bulkiest and heaviest items in our kit, it’s easy to forget the other bag of metal we have to lug around. But Zildjian hasn’t forgotten it, hence the introduction of the City Pack: a set of smaller cymbals designed to pair up with your bop or micro-sized kit. The City Pack comprises a pair of 12" A New Beat hi-hats, 14" A Fast Crash, and the newly released 18" A Uptown Ride. Zildjian fans will be familiar with the aesthetic and tonal characteristics of the Uptown Ride - an unlathed, hammered, natural-finished smaller ride cymbal reminiscent of the much-loved Breakbeat Ride models previously released by Zildjian. Meanwhile, the New Beat hi-hats take the tried-and-tested medium top/heavy bottom formula and shrink it down, alongside the 14" Fast Crash. The crash is classed as ‘paper thin’ although still has a good amount of rigidity, and the newly-designed bell combines with the size to give it its ‘fast’ nature. Let’s not confuse ‘small’ with ‘quiet’. 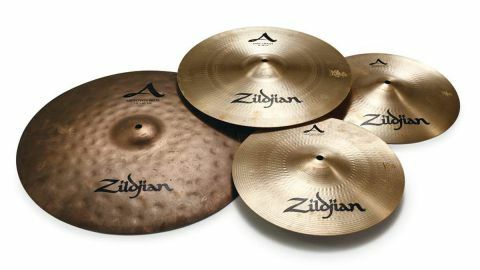 Yes, there are noise-savings to be made with smaller cymbals, but just as a 16" or 18" bass drum can still wake your neighbours, these are not ‘quiet’ cymbals of the same breed as Zildjian’s L80 or even Sabian’s FRX models. At the same time, the smaller sizes aren’t likely to shave massive amounts of weight off your load-in workout. The aim of the game here is to provide a suitable accompaniment to your choice of drums. And a big part of that is eliminating the wash and overtones of your more traditional cymbal setup, which cloud smaller stages for sustained periods. Starting with the ride. The combination of the size and finishing offers a relatively dark attack with a dryness that means your sticking comes across clearly, but with a lack of wash building up to clutter things. Likewise, the small bell still cuts with plenty of bite, but there’s a darkness to it that means it won’t remove your audience’s ears. While it is designed to decay quickly, it’s not without its ability to crash too - albeit fairly dry, but we think that funk, jazz, blues and fusion players will love the dynamic nature of the Uptown Ride. Next up are the hi-hats, and picking them up you’ll notice just how heavy that bottom hat is. This is sort of the New Beat’s formula though, and a big part of the reason they’re considered by many to be the definition of a hi-hat sound. The resulting tone from the medium/heavy pairing gives us that quintessential solid ‘chick’ when stepped, and yet again, stick definition is a key feature with fast 32nd notes all articulating nicely, followed by the smooth, bright cut of open barks. The size means that these hats obviously aren’t really for rock. They will get sloshy, but trying to play anything heavier than singer-songwriter style grooves makes us feel a bit like Scrappy-Doo turning up to a bar brawl. As with previous smaller Zildjian hi-hats we’ve tried, the 12s do omit a slight ‘pinginess’ as an overtone, but it’s also this brightness that helps the hats to cut through. Finally, there’s the 14" Fast Crash, which is also the part of the pack we were most sceptical about. In a world where most people’s crashes are the same size as the ride in this pack, we wondered if it would have the power to hold its own among the other cymbals here. Small crashes can also have a tendency to fall between sounding like large splashes with too much throat, alternatively, they can be difficult to open up dynamically, producing an ‘all or nothing’ sort of sound. We were relieved, then, to find that this one was neither. The paper-thin weight means that it is expressive, but it still has plenty of body. It certainly lives up to its ‘Fast’ name by exploding with the pitch and tonality of a larger cymbal, then dying out quickly too. It’s impressive, rivalling our 16" medium crash in terms of power.